Sun-Commercial photo by Jenny McNeece | One of the 16 bedrooms in the old county poor farm on South Hart Street Road is pictured. The 140-year-old Victorian building has pretty much been abandoned for the last 12 years and is in need of considerable repair. The county commissioners are trying to figure out what to do with the facility, which is listed on the Indiana Register of Historic Sites and Structures and is being considered for designation on the National Register of Historic Places. Sun-Commercial photo by Gayle R. Robbins | The former county poor farm on South Hart Street Road is again back in the hands of the county commissioners, who are trying to decide how the 140-year-old building should be used. The building has basically been abandoned for around a dozen years. Sun-Commercial photo by Jenny McNeece | Another of the rooms in the 140-year-old Victorian building on South Hart Street Road that once served as the county's poor farm. Sun-Commercial photo by Gayle R. Robbins | The former county poor farm on South Hart Street Road is again back in the hands of the county commissioners, who are trying to decide how the 140-year-old building should be used. A Pennsylvania-based “ghost hunter” has once again shared a video on a Facebook page dedicated to his acquiring the county's old poor farm, calling out the county commissioners for their lack of response to his request. Adam Kimmell, producer and director of "Resident Undead," a paranormal documentary show on Youtube, first expressed his desire last fall to take over the old poor farm, a 140-year-old Victorian building located on Hart Street Road. Hearing nothing from the commissioners in response, he opened a Facebook page, “Knox County Poor Asylum,” in January to apply a bit of pressure and share with residents his plans for the building. On Wednesday, he posted yet another video, this one more pressing than the first. In two days, it was shared 80 times and had more than 2,500 views. In it, he takes viewers on a 14-minute tour of another property he owns, the Madison Seminary, in Madison, Ohio, essentially using it as an example of what he hopes to do with the poor farm should the commissioners choose to let him give it a try. He touts his efforts over the last two years to recreate individual rooms inside the Madison Seminary — one he says is three times the size of the poor farm here — using period-appropriate furniture and old hospital equipment. “It's not OK to read about these places in a history book,” he says in the video. “Children can step in and actually touch living history. Kimmell also strikes out at commissioner Trent Hinkle, who hasn't been on board with Kimmell's plan, instead choosing to begin researching grants that could be used make repairs to the building and find an adaptive reuse. Hinkle says in the clip that he wants to fix it up then “sell it or shop it out” to someone interested in developing it. Commission president Kellie Streeter said Kimmell's aggressive — and public — tactics have caused her to take a step back. She takes issue with Kimmell's insinuations that the commissioners don't care about the building. Streeter said the commissioners' next step is to sit down and develop a list of criteria for anyone — Kimmell included — interested in taking on the building, all while researching funding sources of their own. “I will gladly sit down and talk about real ideas, real plans and real sources of funding,” Streeter said. Kimmell has said he is willing to invest the $50,000 in the building — including $20,000 in roof repairs over the next five years — but Hinkle says it's not nearly enough. Hinkle has been working with Sure Clean, 2805 Fulton Glass Road, in getting estimates for basic repairs. “And while ($20,000) seems like a big number, knowing what I know now, it's a drop in the bucket of what it's going to take to do the job,” he said of the roof. 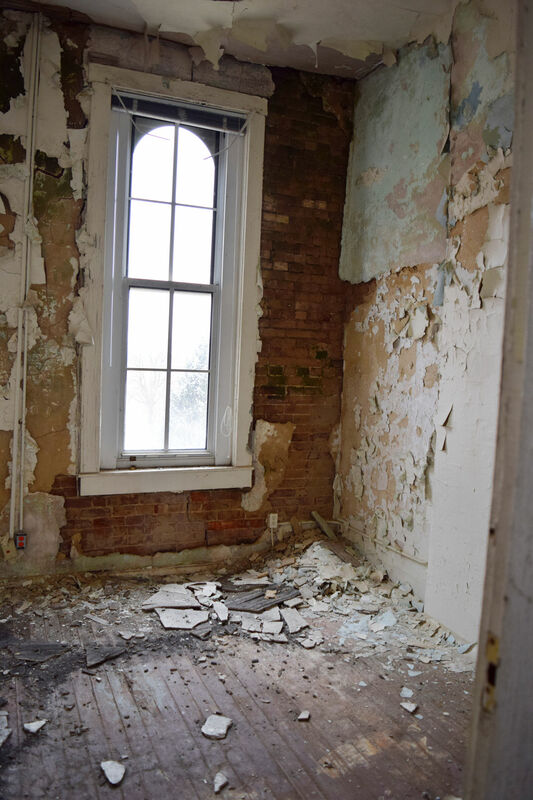 Hinkle also said he's spoken with the state Department of Natural Resources about applying for a $50,000 historic preservation grant, the same fully matching grant secured for an ongoing restoration of the shelter house at Gregg Park and for a window and masonry project two years ago at Vincennes Police Department Headquarters at 501 Busseron St. He has also, he said, spoken with the Southern Indiana Development Commission in Loogootee about applying for a $500,000 state Community Development Block Grant, the same one county officials have applied for twice and yet failed to get for an exterior restoration of the Pantheon Theatre at 428 Main St., the site of a proposed shared workspace and small business incubator. Kimmell's plan is to reopen the building as a ghost-themed tourist site. He plans to host paranormal investigations, flashlight tours and public ghost hunts, all of which would draw paranormal enthusiasts, history buffs and urban explorers from hundreds of miles away, he has said. He claims to have earned $35,000 in profits from the Madison Seminary in just two years. And he argues that the local economy, too, will feel a boost from increased tourism. But the commissioners question whether he has fully grasped just how much it will cost to make adequate repairs to the building. They didn't either — until recently, that is. The roof needs replaced and years of water damage have developed into black mold. The windows are broken and walls — or the walls that are left — are littered with graffiti. Still, the building maintains much of its historic charm, complete with near 13-foot ceilings, tall, ornate windows, exposed brick and magnificent fireplaces. Years ago, the commissioners gave the deed to the poor farm — with stipulations — to local pastor Sandy Ivers as she hoped to turn it into a shelter for women. The project was largely forgotten, that is until Kimmell's unexpected request caused the commissioners to look more closely into that agreement to see if it was still valid, especially since the property was still in a serious state of disrepair. But Ivers earlier this month said she was no longer interested in the building. Several from the community have reached out and offered their help to Kimmell, he claims in the video, and the majority of the comments posted under the video are supportive in nature. Some have even created the hashtag, #IStandWithAdamKimmell. “They want the tourism, they want Vincennes to be recognized,” Kimmell says. He calls on the commissioners to take an official vote on his proposed plan. Yet even if the answer is no, he said he isn't going anywhere anytime soon.